Meet 10 month old Katie, August winner of the Stinky Couture™ photo contest. Photo submitted by her mama Tori. We are quite sure that this little cowboy is looking for his horse…he knows that he left it somewhere! June’s winner of the Stinky Couture™ photo contest is Tracy’s baby. He is wearing a Stinky Couture™ Signature Series side snap fitted cloth diaper featuring toy cowboys that are reminiscent of days gone by. We would love to share more about him though we have only the picture submitted by his mama Tracy. In the excitement of sharing this picture with us, Tracy neglected to give us the details. Regardless this picture is a winner! This months SC photo contest winner is 11 month old Cameron. May in the Colorado Rockies can mean much rain and yes even snow still. How delighted we were to see Cameron sunning on a beautiful Spring day in Stinky Couture™ ! Photo taken by Cameron’s mama Valerie. 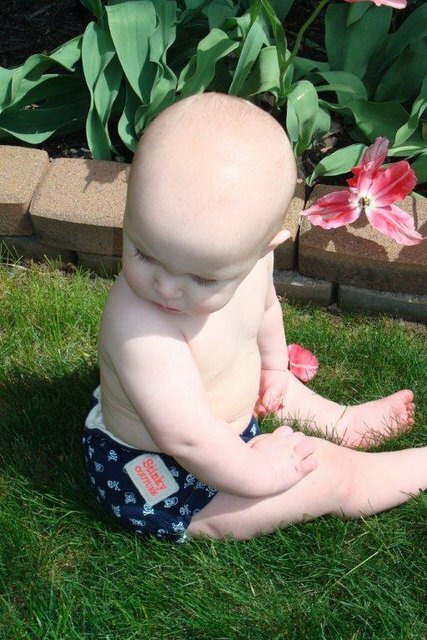 You too could win a free Stinky Couture™ diaper by entering our monthly photo contest. We love our SC Babies! Indeed I have grown quite fond of sweet baby Avery. That being said I did not participate in choosing this month’s SC photo contest winner. Being that I love all of the photos submitted, I really am no help when it comes to choosing a winner. Each and every one of the submitted photos is special and a treasured gift. As time allows we will be uploading more photos to the SC Flickr gallery. We LOVE your babies in Stinky Couture™! We are excited to announce the official start of the Stinky Couture™ photo contest. The contest will run monthly starting March 1, 2008. Winners will be chosen monthly from the previous month’s photo submissions with a cutoff of midnight Mountain Time on the last day of the month. * April 1, 2008 we will announce the first winner and every 1st thereafter. The winner will receive a Stinky Couture™ fitted diaper*. When submitting photos, please keep it real. We love babies and we love them as they are whether that be happy, messy, cranky, hungry, fussy, sleepy. So get competitive, HAVE FUN and we’ll look forward to seeing your sweet babies in Stinky Couture™! *All photo submissions to date will be considered for the month of March. 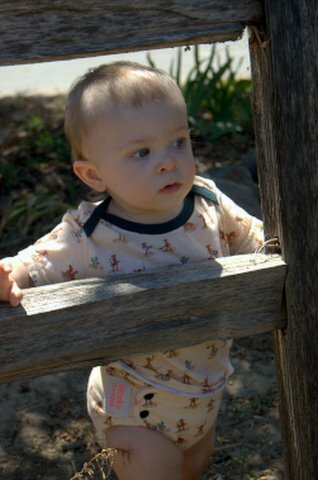 We LOVE seeing your babies in Stinky Couture™! Here are a few tips that we thought might be helpful when trying to get that candid shot. When photographing children, patience is a must. Have fun! Don’t expect to get that perfect shot immediately. Sit back and wait for the right moment, then snap away. Get close to your Baby! Be sure to fill the camera’s viewfinder or LCD display with your Baby to create pictures with greater impact. Get close to your Baby or use your camera’s zoom to emphasize what is important and exclude the rest. When a flash is needed it is better to get a little further back and utilize the zoom function of your camera. Eye-to-eye contact is as engaging in a picture as it is in real life. Laying on your belly or sitting on the ground is a great way get a picture from a child’s perspective. By doing this, your Baby’s expressions will be natural, your flash photos will be more evenly lit from nose to toe, and the background will probably look a lot better, too. Visual cropping: Try cropping your photo visually prior to taking it. Fill the view finder or LCD display. When doing so are there things that you see that shouldn’t be there? You can crop, or remove, these elements easily by moving closer or utilizing the zoom feature on you camera. Crop it after the fact: Whether you take your photos to be processed or download pictures to your computer, cropping is easy! Cropping really can make a good photo great! Ignore the impulse to force your Baby to pose staring at the camera. Candid pictures that are real and not forced really are best. A dirty face, mismatched socks and bed head are just a few warm examples of childhood that one can connect to. We have oh so many pictures of our children as they are… children.